Dedicated to diligent students of the Word! 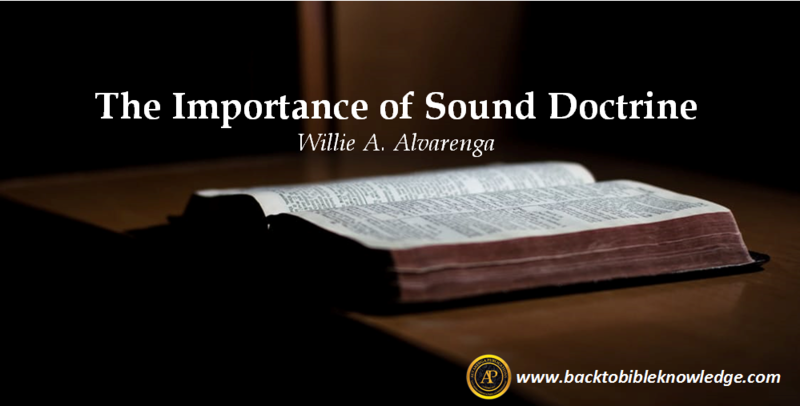 Sound doctrine is important because it comes from God. Yes, my brethren, sound doctrine only comes from God, since it is inspired of Him. The Apostle Paul wrote the following concerning the inspiration of the Scriptures, “All Scripture is given by inspiration of God, and is profitable for doctrine, for reproof, for correction, for instruction in righteousness” (2 Timothy 3:16). Sound doctrine is important because it is inspired of God, since holy men of God spoke, being moved by the Holy Spirit (2 Peter 1:20-21). Therefore, we, as faithful Christians, must respect the doctrine of Christ at all times. Sound doctrine is important because God expects us to proclaim it. The Apostle Paul commanded Titus to speak those things which were proper to sound doctrine (Titus 2:1). Even the young evangelist Timothy was commanded to uphold the patter of sound words (2 Timothy 1:13). Sadly, there are many who are showing no respect for the authority of sound doctrine, and refuse to proclaim it just the way we find it in the Scriptures. As faithful children of God, we must take heed to the command to emphasize sound doctrine in our lives and in our teaching and preaching of God’s Word. Sound doctrine is important because it can help us grow spiritually. False doctrine cannot help us in any way to grow spiritually. The only Word that can help us grow the way God wants us to grow is His Word. God’s Holy Word is able to make us wise unto salvation (2 Timothy 3:15; cf. 1 Peter 2:1-2), and is able to build us up (Acts 20:32).This is why the Apostle Peter exhorts us to grow in the knowledge of God’s Word (2 Peter 3:18). May the Lord give us the wisdom to always uphold sound doctrine in our lives. Sound doctrine is important because it can help us to refute error. Yes, my brethren, sound doctrine can help us to refute the error of false doctrines that are being promoted in our days. Sound doctrine can help us to know that baptism is essential to salvation (Mark 16:16; 1 Peter 3:21; Acts 2:38). It can help us to know that there is only one true Church of Christ (Matthew 16:18; Acts 2:47; Ephesians 4:4). It can help us to know that salvation can be lost (Philippians 2:12; 1 Corinthians 9:27; Revelation 2:10). The more we study sound doctrine, the better off we will be regarding defending the doctrine of Christ (1 Timothy 1:3; Jude 3). Sound doctrine is important because not to obey it will bring terrible consequences. A careful study of the Bible reveals that not to obey the doctrine of Christ will result in divine punishment from God. The Apostle John wrote in 2 John 9-11 that those who do not keep the doctrine of Christ will not have God nor Jesus on their side. If you do not have the Father nor the Son in your side, then you cannot be saved. Those false teachers in the context of 2 John were denying the incarnation of Jesus Christ (v. 7). Anyone who perverts the doctrine of Christ will not spend eternity in heaven! Therefore, sound doctrine is important! Sound doctrine is important because it can help people know the right way to make it to heaven. False doctrine cannot teach a person the right way to make it to heaven. Only sound doctrine can accomplish such a task. The wrong address will not guide you to the right destiny! Any honest person who studies the New Testament will learn what he or she must do in order to be in a saved condition in the sight of God. The Bible teaches that an honest person will be able to discern the right doctrine (John 7:17). The plan of salvation according to the New Testament is for a person to hear the gospel (Rom. 10:17), believe in the gospel (Mark 16:16), repent of his or her sins (Acts 2:38), confess Christ as the Son of God (Rom. 10:9-10), be immersed in water for the forgiveness of sins (Acts 2:38; 22:16; Mark 16:16), and live a faithful life in Christ (Rev. 2:10; 1 Corinthians 15:58; Philippians 2:12). False doctrine only teaches error regarding salvation. We must uphold sound doctrine because this doctrine is the only one that can show people the right way into heaven. May the Lord help us to always uphold sound doctrine in our lives! Is the Truth Valued in my family? This is a lesson presented at the University Church of Christ in Tyler, TX during their 2017 Summer Series. I pray that this lesson may be a great source of encouragement for all of us. Thank you for taking the time to consider the material presented. Please feel free to use this outline. We trust that the work of the Lord is going well with the good congregation there. There is so much to do, and so few to do it (Luke 10:2). In the year of 2015 we appealed urgently to the brotherhood for financial assistance. The reason for our request was due to a high deficit that we were accruing monthly. With the increase in the cost of living and congregations and individuals having to stop their support or decrease the amount donated, our funds began to diminish rapidly. Due to the diligent efforts of the brethren working with the school, we had a surplus that we were able to survive on for a time, but we knew that these funds would soon deplete. Therefore we appealed to you. During that time we were greatly encouraged because many of you responded hastily, and for that we again say thank you. However we humbly plea to you all again. Though many of you made sacrifices in order to assist us, some very generous, we still did not meet the requested need. Our request was to get 150 congregations or individuals to commit to $100 a month, and that goal was not achieved. Of the requested amount, we were able to get about half to commit. So we have found ourselves in this position once again, needing our beloved brethren’s assistance. We do hope to fulfill this goal with your assistance. Though this is what we hope to accomplish, any amount will be appreciated. We hope and pray that our plea is given prayerful and careful consideration. If you would like to speak with someone personally regarding our need, you can speak with me (Dean of Students), Robert Stapleton(Director), Willie Alvarenga (Director of the Spanish Department) or Jesse Martinez (Spanish Instructor) at 817-268-3222. There is no doubt that there are several great chapters in the Bible! Of all the 260 chapters of the New Testament, Acts 2 is one of my favorites! For the next few minutes, we will be examining the second chapter of the Book of Acts. I am sure that there have been many great lessons preached from this chapter. I, myself, have preached 5 different sermons from this chapter. What I am about to tell you, I’m sure you heard it all before! In this lesson we will consider some things we can learn from the beginning of the church. A great fulfillment of Bible prophecies. A great preaching of the Gospel of Christ. A great manifestation of an obedient faith. A great establishment of a divine institution called church and kingdom. A great manifestation of Christian faithfulness. Share this lesson with friends and family. Appreciate the church for which Jesus died on the cross. Imitate the early church and her faithfulness to God. Be doers of the practical lessons we can glean from this lesson. Obey the gospel of Christ, if you have not done so. With this in mind, let us meditate upon what God has in store for us. A GREAT MULTITUDE PRESENT (2:1-12). The Sacred text reveals that about 16 nations were present during the celebration of the Jewish feast called, Pentecost. There were thousands of people present because the text reveals that about 3,000 souls obeyed the Gospel of Christ (v. 41). This amount cannot be interpreted to say that this was the total amount of people present for this feast. This amount implies the presence of more people. God’s providence made it available for the church to begin in such a wonderful day when lots of people were present. What is the significance of the great multitude? Why was it important for this great multitude to be present? The answer is simple: The Gospel of Christ was going to be taken to several nations so that churches could be established in various places of the world. We learn from the letter of Paul to the romans that he had not been there (Romans 1:8-13). How was the church established in Rome? We could assume that someone from Pentecost took the gospel to the city of Rome. So, as we can see, at the beginning of the church we see a great multitude present. Obviously, only a small amount of this great multitude decided to obey the Gospel of Christ. A GREAT FULFILLMENT OF BIBLE PROPHECIES (2:14-35). At the beginning of the church we also see a great fulfillment of Bible prophecies. The establishment of the church of Christ. Joel 2:28-32 – God had promised to pour out His Spirit on all flesh. We see the fulfilling of this prophecy in Acts 2. Jesus had said that the Holy Spirit would come upon the apostles (John 14:26; 15:26; 16:13; Luke 24:49). This promise was fulfilled! Psalm 16:8-11 – God had promised not to leave Jesus in Hades, nor will His Holy One see corruption. Even Jesus himself predicted His own resurrection (John 2:20-22; Matthew 16:21; Mark 8:31). 2 Samuel 7:12-13 – God had promised that His Son, Jesus Christ would establish the house of God, that is, the church. Isaiah 2:1-4 – God prophesized that in Jerusalem his house was going to be established. Daniel 2:44 – God had promised that in the days of the Roman kings, He would set up a kingdom that would never be destroyed. Jesus himself predicted the establishment of the church/kingdom (Matthew 16:16-19; Mark 9:1). This prediction came to pass! In Acts the second chapter, we read about the fulfilling of these great Bible prophecies! Herein we see the inspiration of the Scriptures (2 Timothy 3:16-17; 2 Peter 1:20-21). All of these great Bible prophecies teach us that God is faithful to fulfill that which He had promised aforetime! A GREAT PREACHING OF THE GOSPEL (2:22-40). Before Jesus ascended into heaven, He instructed His apostles to go into all the world and preach the Gospel (Mark 16:15; Matthew 28:18-20). The Gospel is God’s power to save man (Romans 1:16). This message tells us that Jesus came, die, was buried and raised on the third day (1 Corinthians 15:1-4). The second chapter of the book of Acts also teaches us about the preaching of the Gospel of Christ. Notice the phrase, “When they heard this” (v. 37). What does the word “this” refers to? In Acts 2:22-32 we read how Peter preached the death, burial and resurrection of Christ. This is the message that you and I, as Christians, need to proclaim to the whole world! Acts 2:16-40 – About 25 verses. In these 25 verses we see 13 Old Testament Scripture references by Peter. 50% Scripture / 50% Explanation of these verses! We must fill our preaching with Bible! This is a great practical lesson for us as ministers. We must preach the Word of God (2 Timothy 4:1-5; 1 Peter 4:11). Today we see too much story telling coming out from the pulpits. We need to go back to the Bible and preach the way those faithful men did it! When the Word of God is proclaimed, great results will follow! A GREAT MANIFESTATION OF AN OBEDIENT FAITH (2:36-41). In this second chapter of Acts we learn about a great manifestation of an obedient faith. When the Gospel of Christ was preached, great results followed! We see honest people being pricked to their hearts (v. 37). We see honest people seeking for salvation (v. 37). The Bible tells us that after they were told what to do (vs. 38-40), they obeyed the Gospel of Christ. Acts 2:41 is one of the beautiful passages we can use to talk about an obedient faith. These people did not accept Jesus as their personal Savior or prayed Jesus into their hearts. These people showed an obedient faith by obeying the Gospel of Christ! To be baptized into Christ (Galatians 3:27; Acts 2:47). To be saved (Mark 16:16; 1 Peter 3:21). To receive forgiveness of sins (Acts 2:38; 22:16). Back then, one sermon—three thousand souls; today, three thousand sermons—one soul. People need to think more seriously about their eternal home! A GREAT ESTABLISHMENT OF A DIVINE INSTITUTION: THE CHURCH/KINGDOM (2:47). In this second chapter of Acts we also learn another great truth—the establishment of a divine institution/church. This establishment was according to the Old Testament prophecies that were made concerning the church/kingdom (Isaiah 2:1-4; Daniel 2:44). Jesus promised to establish His church/kingdom (Matthew 16:18). There are some that teach that the church and the kingdom are two separate divine institutions; the church having been already established and the kingdom is to come in the future. There is no biblical support for this type of interpretation. The church was prophesied in the Old Testament (Isaiah 2:1-4). The kingdom was prophesied in the Old Testament as well (Daniel 2:44). Christ promised the establishment of His church (Matthew 16:18). Christ promised the establishment/coming of the kingdom (Mark 9:1). Those who obey the Gospel are added to the church (Acts 2:47). Those who obey the Gospel are added to the kingdom (Colossians 1:13). Christians were called to the one Body (Colossians 3:15). Christians were called to the kingdom (1 Thessalonians 2:12; 2:14). Through baptism a person enters into Christ (Acts 2:41, 47; Galatians 3:27; 1 Corinthians 12:13). Through baptism a person enters into the kingdom (John 3:3, 5). As we can see, the biblical evidence shows that the church and the kingdom is the same divine institution established by God and Christ at the Day of Pentecost—in Acts 2. A GREAT MANIFESTATION OF CHRISTIAN FAITHFULNESS (2:42-47). Yes, brothers and sisters! In this chapter we see a great display of faithfulness to God. First, they gladly receive God’s Word (Acts 2:41). Second, they were willing to obey the command to be immerse in water (Acts 2:41). Third, they continued in the apostles’ doctrine (Acts 2:42). Fourth, they continued in fellowship with one another (Acts 2:42). Fifth, they continued observing the Lord’s Supper (Acts 2:42; 20:7). Sixth, they continued praying to God (Acts 2:42; 1 Thessalonians 5:17). Seventh, they continued showing love for one another (Acts 2:44-46). Eight, they enjoyed favor with all the people. They were making a difference! (Acts 2:47). The early church has a lot to teach us today! May we always look back at those golden times when faithfulness to God and His Word was a priority in the Christian’s life! A great establishment of a divine institution: the church/kingdom. May we always appreciate this great chapter and may we never stop preaching from it! Orin Root & John W. Wade. Standard Bible Commentary on the Book of Acts (Cincinnati, OH: Standard Publishing, 1965), p. 17. What a great blessing it is to speak about God and the Lord’s church! I am privileged to be part of the New Testament church for which God still cares! This is a Bible subject, and therefore, I rejoice to preach about the Word of God! (Psalm 119:97). This is a vital topic which involves a life and death matter (Acts 2:47; Ephesians 5:23). Love and appreciate the church for which Jesus died! Be a doer of God’s Word! (James 1:22). If you have not been added to the church of the New Testament, I would like to encourage you to do so today! At the end of my lesson, I will share with you a way on how you can obey the gospel of Jesus Christ! Let us, therefore, examine the topic, “God Still Cares about the Lord’s Church! SOME GREAT LESSONS ABOUT THE LORD’S CHURCH. There are several great lessons the Bible teaches regarding the New Testament church/the Lord’s church. The church is a divine institution established on the Day of Pentecost (Acts 2). This was in accordance with Old Testament prophecies (Isaiah 2:1-4; 2 Samuel 7:12-14). Jesus himself promised to establish His church (Matthew 16:18). The church and the kingdom are one and the same divine institution. This kingdom was also prophesized in the Old Testament Scriptures (Daniel 2:44). Those who obey the gospel are added to the church and kingdom (Acts 2:47; Colossians 1:13). Christians were called to the one Body/church (Colossians 3:15; 1 Thessalonians 2:12; 2:14). Through baptism a person enters into Christ/kingdom (Acts 2:47; Galatians 3:27; 1 Corinthians 12:13; John 3:3, 5). The church belongs to Christ (Matthew 16:18; Acts 2:47; Galatians 3:27; Ephesians 1:22-23). The church is not a denomination, but the one true church of the New Testament. It was not founded by man-made religions, but God! Salvation is only found in the church of Christ (Acts 2:47; Ephesians 5:23; John 14:6; 1 John 5:11). These are some of the great lessons we can learn from the Bible regarding the Lord’s church. These are the great lessons that cause us to love the church and to realize how God still cares for the church of His Son, Jesus Christ! Let us also consider the way God has taken care of the church in times past! GOD HAS TAKEN CARE OF THE CHURCH IN THE PAST. God has taken care of the church even from the past/eternity! The church was in the mind of God before the foundation of the world (Ephesians 1:4). The blood with which the church was purchased was in the mind of God before the foundation of the world (1 Peter 1:18-20). God made sure that His plan was fulfilled in the church/in Christ! We see this from the first Old Testament prophecy of Genesis 3:15 all the way to the New Testament. We see this in God’s scheme of redemption which was planned before the foundation of the world (1 Peter 1:18-20). God made sure that the church of His Son, Jesus Christ, was established on Pentecost. We see this was done through the resurrection of His Son (Acts 2:22-32). God chose a perfect day to begin His church: Lots of people in attendance! Everything took place according to God’s plan! God took care of the church even after her establishment. He took care of the apostles and those who preached the gospel to every creature under God’s Sun (Acts 8:1-5; Mark 16:15). The reason why we see a tremendous church growth in the first century is because God was taking care of the church (Acts 2:41; 4:4; 5:12-14; 6:7; 8:4; 11:24; 12:24; 17:6). God has taken care of the church even throughout the ages, and even into our own generation. God has taken care of the church even from times past! Through the Holy Scriptures we can also observe how God is taking care of the church, even in our present age! GOD IS STILL TAKING CARE OF THE CHURCH IN THE PRESENT. How do we know God is taking care of the church in the present? The fact that the church is still in existence today helps us to see how God still cares for His church today! The fact that people are still being added to the New Testament church is proof that God still cares for His church! God has given us all things that pertain to life and godliness (2 Peter 1:3). Friends, this is proof that God still cares for His church! The preservation of His Word is what keeps the church alive! We have the Scriptures available to us today. These Scriptures can help the church in many ways! God’s Word equips us unto every good work (2 Timothy 3:16-17). God’s Word makes us wise unto salvation (2 Timothy 3:15). God’s Word can save us (James 1:21). God’s Word can give us happiness (Jeremiah 15:16). God’s Word can help us to refute error and overcome temptations (Matthew 4:1-12; Ephesians 6:17; Hebrews 4:12; Psalm 119:11). The fact that we have a copy of God’s Word in our hands is proof that God still cares for His church in the present! Even though there are thousands of divisions today in the church, the faithful church continues to uphold the doctrine of the apostles (Acts 2:42). Why? Because God still cares for His church and He will be with those who uphold His doctrine (2 John 9). We will suffer in this life (2 Timothy 3:12; Philippians 1:29; Acts 14:22). Jesus has promised to be with us (Matthew 28:20; John 16:33). God has promised to never leave us nor forsake us (Hebrews 13:5). Nothing can separate us from the love of God which is in Christ Jesus (Romans 8:31, 36-38). We have all the encouragement we need to continue living a faithful life in Christ! There is no doubt that God still cares for His church even in our present age! What a great encouragement it is to know that God will take care of the church, even in the future! GOD WILL TAKE CARE OF THE CHURCH IN THE FUTURE. How will God take care of His church in the future? We can answer this question with just two words: ETERNAL SALVACION! Yes, God has promised eternal salvation for His church! This is the way in which God will take care of His church! Jesus is the only way to eternal salvation (John 14:6; 2 Timothy 2:10). Eternal salvation is in Christ (John 11:25-26; 1 John 5:11). Jesus is our hope of glory (Colossians 1:27; Titus 1:2; 1 John 5:11). Eternal salvation is found in the one true church of the Bible (Acts 2:47; Ephesians 5:23). Remember, the church is the body of Christ! (Ephesians 1:22-23). Those who want to be saved must be members of the one true church of Jesus Christ! (Acts 4:12; 2 Timothy 2:9). God will take care of the church in the future by providing a beautiful entrance into the eternal kingdom of God! One day Jesus Christ will turn the kingdom over to the Father (1 Corinthians 15:24), and so shall we be with the Lord forever (1 Thessalonians 4:16-18). What a wonderful encouragement this is! Having considered four points that deal with the way how God has taking care of the church in the past, present and future, let us now briefly examine the way how a person can become a member of this great church! HOW TO BE A MEMBER OF THE LORD’S CHURCH. The Bible is clear on who you can become a member of the one true church of the Bible. Hear the Gospel of Christ (Acts 2:37; 2:22-32). Believe in the Gospel message (Mark 16:16). Be willing to repent of his/her sins (Acts 2:38; 3:19; 17:30). Be willing to confess Christ as the Son of God (Romans 10:9-10; Matthew 10:32-33). Be willing to be immerse in water in order to receive forgiveness of sins (Acts 2:38; 22:16; Mark 16:16). Be faithful during your Christian life (1 Corinthians 15:58; Philippians 2:12; Revelation 2:10). The church is the Body of Christ (Ephesians 1:22-23; 4:4; 5:23; Colossians 1:18). After obedience to the gospel, you become a son of God (John 1:11-13); you are reconciled to God (Ephesians 2:13-16); you become a member of the family of God (Ephesians 2:19); you become a new creature in Christ (2 Corinthians 5:17; Romans 6:4). You need to obey the Gospel today, before it is eternally too late! (2 Corinthians 6:1-2; James 4:14; Proverbs 27:1). What a great blessing it is to talk about God and His church! May we always learn to appreciate and love the church for which Jesus gave His life on the cross! Let us live a faithful life in Christ, for this is the only way to show God how much we appreciate his care of the church! Blessed are they that memorize the Word of God: for they will always be ready to give an answer (1 Peter 3:15). Blessed are they that memorize the Word of God: for they will not walk in darkness (Psalm 19:8; 119:105). Blessed are they that memorize the Word of God: for they will overcome temptation (Matthew 4:1-11; Ephesians 6:17). Blessed are they that memorize the Word of God: for they will be a happy people (Jeremiah 15:16; Psalm 19:8). Blessed are they that memorize the Word of God: for they will grow in the knowledge of God’s will (2 Peter 3:18; 2 Timothy 2:15). Blessed are they that memorize the Word of God: for they will keep the commandments of God (Psalm 119:2; John 14:15). Blessed are they that memorize the Word of God: for they will be an intelligent people (Ephesians 5:17; Psalm 119:104, 130). In the passage of 1 Peter 3:16 Peter speaks about the reality of Christians suffering for their good manner of life in Christ. This is emphasized not only in this passage, but also throughout the entire letter of first Peter. In this brief study, it is my desire to provide several principles that will help us tremendously to have a proper response to slander. I will, therefore, briefly analyze the word slander and then practical principles on how to respond to it will be provided. As we examine this brief study, let us keep in mind the words of James 1:22, “But be ye doers of the word, and not hearers only, deluding your own selves.” Remember that the only way to benefit greatly from God’s Word is to put it to practice in our daily lives (Luke 11:28). Bless them that curse you, and pray for them which despitefully use you (Luke 6:28, emphasis added). Having a good conscience; that, whereas they speak evil of you, as of evildoers, they may be ashamed that falsely accuse your good conversation in Christ (1 Peter 3:16). Other translations of the Bible use words such as revile (ASV, NKJV, ESV), falsely accuse (KJV), slander (NIV). The grammar of this verb is found in the present, active participle, which denotes a continuous action. These Christians were being slandered, and falsely accused continually by their adversaries. How can faithful Christians respond when they are being slandered all the time? Does the Bible provide any helpful assistance on what we can do? Let me suggest that you prayerfully consider the following ways on how you and I can respond when we are falsely accused. The Apostle Peter in this first letter emphasizes the truth that faithful Christian will suffer in this world considerably. If we study this first letter carefully, we will arrive at the conclusion that the central theme of this letter is suffering which faithful Christians will experience, and how they should respond to it. There is no doubt that all faithful Christians around the world will experience suffering during our time on earth. The Apostle Peter tells Christians that Satan walks about as a roaring lion, seeking whom he may devour (1 Peter 5:8). This enemy of ours will try his best to discourage us from living the Christian life, and from entering heaven someday. Remember that he will hinder our way to heaven (cf. 1 Thessalonians 2:18). The Apostle Paul also warned Christians that if they lived a faithful life in Christ, they were going to suffer tribulations (2 Timothy 3:12; cf. Philippians 1:29; Acts 14:22; James 1:2). Jesus also warned His disciples about the reality of suffering for His cause (John 16:33). Most of us have experienced difficult times just for trying to live a faithful life in Christ. Personally, several false teachers with regards to the doctrine of marriage, divorce and remarriage have falsely accused me of teaching false doctrine. These people argue in this way because I do not teach what they believe. The Brown Trail School of Preaching has been falsely accused of using instrumental music in our building. I, also, was falsely accused of having divorced my wife; something obviously not true! It is imperative that we as Christians continue steadfast in the Lord so that we may not cast away our boldness, which hath great recompense of reward (Hebrews 10:35). We need to keep in mind that a Crown of life awaits those who remain faithful to the Lord, even in the midst of trials (cf. James 1:12; Revelation 2:10; 2 Timothy 4:6-8). Remember that you are not alone (1 Peter 1:3-5). 3Blessed be the God and Father of our Lord Jesus Christ, who according to his great mercy begat us again unto a living hope by the resurrection of Jesus Christ from the dead, 4unto an inheritance incorruptible, and undefiled, and that fadeth not away, reserved in heaven for you, 5who by the power of God are guarded through faith unto a salvation ready to be revealed in the last time (Emphasis added). Remember that being slandered is part of the proving of your faith (1 Peter 1:6-7). 6Wherein ye greatly rejoice, though now for a little while, if need be, ye have been put to grief in manifold trials, 7that the proof of your faith, being more precious than gold that perisheth though it is proved by fire, may be found unto praise and glory and honor at the revelation of Jesus Christ. Remember to continue living a holy life in Christ, even when you are being slandered or persecuted (1 Peter 1:14-15). 14As children of obedience, not fashioning yourselves according to your former lusts in the time of your ignorance: 15but like as he who called you is holy, be ye yourselves also holy in all manner of living; 16because it is written, ye shall be holy; for I am holy. Remember to put away sin from your life; otherwise, you will provide an opportunity for the adversary to accuse you falsely (1 Peter 2:1-2). Putting away therefore all wickedness, and all guile, and hypocrisies, and envies, and all evil speakings, 2as newborn babes, long for the spiritual milk which is without guile, that ye may grow thereby unto salvation. Remember to live a faithful life before those who may falsely accuse you (1 Peter 2:11-12, 15). 11Beloved, I beseech you as sojourners and pilgrims, to abstain from fleshly lusts, which war against the soul; 12having your behavior seemly among the Gentiles; that, wherein they speak against you as evil-doers, they may by your good works, which they behold, glorify God in the day of visitation. 15For so is the will of God, that by well-doing ye should put to silence the ignorance of foolish men. Remember that God is pleased when we suffer with patience, and by so doing, we follow the steps of Jesus (1 Peter 1:20-23). 20For what glory is it, if, when ye sin, and are buffeted for it, ye shall take it patiently? but if, when ye do well, and suffer for it, ye shall take it patiently, this is acceptable with God. 21For hereunto were ye called: because Christ also suffered for you, leaving you an example, that ye should follow his steps: 22who did no sin, neither was guile found in his mouth: 23who, when he was reviled, reviled not again; when he suffered threatened not; but committed himself to him that judgeth righteously. Remember not to render evil for evil (1 Peter 3:8-13). 8Finally, be ye all likeminded, compassionate, loving as brethren, tenderhearted, humbleminded: 9not rendering evil for evil, or reviling for reviling; but contrariwise blessing; for hereunto were ye called, that ye should inherit a blessing. 10For, He that would love life, And see good days, Let him refrain his tongue from evil, And his lips that they speak no guile: 11And let him turn away from evil, and do good; Let him seek peace, and pursue it. 12For the eyes of the Lord are upon the righteous, And his ears unto their supplication: But the face of the Lord is upon them that do evil. 13And who is he that will harm you, if ye be zealous of that which is good? Remember to do your best to have a good conscience at all times (1 Peter 3:16). 16having a good conscience; that, wherein ye are spoken against, they may be put to shame who revile your good manner of life in Christ. Remember to rejoice when you suffer for the Lord (1 Peter 4:12-14). 12Beloved, think it not strange concerning the fiery trial among you, which cometh upon you to prove you, as though a strange thing happened unto you: 13but insomuch as ye are partakers of Christ’s sufferings, rejoice; that at the revelation of his glory also ye may rejoice with exceeding joy. 14If ye are reproached for the name of Christ, blessed are ye; because the Spirit of glory and the Spirit of God resteth upon you. Remember not to suffer as an evil doer, since by doing this, you will provide an opportunity for your enemies to falsely accuse you (1 Peter 4:15-16). 15For let none of you suffer as a murderer, or a thief, or an evil-doer, or as a meddler in other men’s matters: 16but if a man suffer as a Christian, let him not be ashamed; but let him glorify God in this name. Remember to continue practicing that which is good, even when you are falsely accused or persecuted (1 Peter 4:19). 19Wherefore let them also that suffer according to the will of God commit their souls in well-doing unto a faithful Creator. Remember that you are not the only one that suffers in this world (1 Peter 5:8-9). 8Be sober, be watchful: your adversary the devil, as a roaring lion, walketh about, seeking whom he may devour, 9whom withstand stedfast in your faith, knowing that the same sufferings are accomplished in your brethren who are in the world. Remember to give God the glory even when you are experiencing difficult times in your life (1 Peter 5:11). 10And the God of all grace, who called you unto his eternal glory in Christ, after that ye have suffered a little while, shall himself perfect, establish, strengthen you. 11To him be the dominion for ever and ever. Amen. The Bible provides several examples of faithful people of God who were accused falsely. Let us consider only three examples. At the same time, let us carefully consider how they responded to those who slandered them. And Joseph was brought down to Egypt; and Potiphar, an officer of Pharaoh’s, the captain of the guard, an Egyptian, bought him of the hand of the Ishmaelites, that had brought him down thither. 2And Jehovah was with Joseph, and he was a prosperous man; and he was in the house of his master the Egyptian. 3And his master saw that Jehovah was with him, and that Jehovah made all that he did to prosper in his hand. 4And Joseph found favor in his sight, and he ministered unto him: and he made him overseer over his house, and all that he had he put into his hand. 5And it came to pass from the time that he made him overseer in his house, and over all that he had, that Jehovah blessed the Egyptian’s house for Joseph’s sake; and the blessing of Jehovah was upon all that he had, in the house and in the field. 6And he left all that he had in Joseph’s hand; and he knew not aught that was with him, save the bread which he did eat. And Joseph was comely, and well-favored. 7And it came to pass after these things, that his master’s wife cast her eyes upon Joseph; and she said, Lie with me. 8But he refused, and said unto his master’s wife, Behold, my master knoweth not what is with me in the house, and he hath put all that he hath into my hand: 9he is not greater in this house than I; neither hath he kept back anything from me but thee, because thou art his wife: how then can I do this great wickedness, and sin against God? 10And it came to pass, as she spake to Joseph day by day, that he hearkened not unto her, to lie by her, or to be with her. 11And it came to pass about this time, that he went into the house to do his work; and there was none of the men of the house there within. 12And she caught him by his garment, saying, Lie with me: and he left his garment in her hand, and fled, and got him out. 13And it came to pass, when she saw that he had left his garment in her hand, and was fled forth, 14that she called unto the men of her house, and spake unto them, saying, See, he hath brought in a Hebrew unto us to mock us: he came in unto me to lie with me, and I cried with a loud voice: 15and it came to pass, when he heard that I lifted up my voice and cried, that he left his garment by me, and fled, and got him out. 16And she laid up his garment by her, until his master came home. 17And she spake unto him according to these words, saying, The Hebrew servant, whom thou hast brought unto us, came in unto me to mock me: 18and it came to pass, as I lifted up my voice and cried, that he left his garment by me, and fled out. Throughout the development of this story we see how Joseph remained faithful to his God. This faithfulness brought him suffering since Potiphar’s wife falsely accused him of trying to force her to have sexual activity with her. It is interesting to see how God will always bless His people when they diligently strive to serve Him faithfully. Notice what the text reveals concerning God’s mercy towards the faithful Joseph: “But Jehovah was with Joseph, and showed kindness unto him, and gave him favor in the sight of the keeper of the prison” (Genesis 39:21). People may accuse us falsely, but God will always be there for us (cf. Hebrews 13:5). These adversaries devised a plan to falsely accused Daniel. Let us read the rest of the story to see what these men did, and what God did. 6Then these presidents and satraps assembled together to the king, and said thus unto him, King Darius, live for ever. 7All the presidents of the kingdom, the deputies and the satraps, the counsellors and the governors, have consulted together to establish a royal statute, and to make a strong interdict, that whosoever shall ask a petition of any god or man for thirty days, save of thee, O king, he shall be cast into the den of lions. 8Now, O king, establish the interdict, and sign the writing, that it be not changed, according to the law of the Medes and Persians, which altereth not. 9Wherefore king Darius signed the writing and the interdict. 10And when Daniel knew that the writing was signed, he went into his house (now his windows were open in his chamber toward Jerusalem) and he kneeled upon his knees three times a day, and prayed, and gave thanks before his God, as he did aforetime. 11Then these men assembled together, and found Daniel making petition and supplication before his God. 12Then they came near, and spake before the king concerning the king’s interdict: Hast thou not signed an interdict, that every man that shall make petition unto any god or man within thirty days, save unto thee, O king, shall be cast into the den of lions? The king answered and said, The thing is true, according to the law of the Medes and Persians, which altereth not. 13Then answered they and said before the king, That Daniel, who is of the children of the captivity of Judah, regardeth not thee, O king, nor the interdict that thou hast signed, but maketh his petition three times a day. 14Then the king, when he heard these words, was sore displeased, and set his heart on Daniel to deliver him; and he labored till the going down of the sun to rescue him. 15Then these men assembled together unto the king, and said unto the king, Know, O king, that it is a law of the Medes and Persians, that no interdict nor statute which the king establisheth may be changed. 16Then the king commanded, and they brought Daniel, and cast him into the den of lions. Now the king spake and said unto Daniel, Thy God whom thou servest continually, he will deliver thee. 17And a stone was brought, and laid upon the mouth of the den; and the king sealed it with his own signet, and with the signet of his lords; that nothing might be changed concerning Daniel. 18Then the king went to his palace, and passed the night fasting; neither were instruments of music brought before him: and his sleep fled from him. 19Then the king arose very early in the morning, and went in haste unto the den of lions. 20And when he came near unto the den to Daniel, he cried with a lamentable voice; the king spake and said to Daniel, O Daniel, servant of the living God, is thy God, whom thou servest continually, able to deliver thee from the lions? 21Then said Daniel unto the king, O king, live forever. 22My God hath sent his angel, and hath shut the lions’ mouths, and they have not hurt me; forasmuch as before him innocency was found in me; and also before thee, O king, have I done no hurt. 23Then was the king exceeding glad, and commanded that they should take Daniel up out of the den. So Daniel was taken up out of the den, and no manner of hurt was found upon him, because he had trusted in his God. 24And the king commanded, and they brought those men that had accused Daniel, and they cast them into the den of lions, them, their children, and their wives; and the lions had the mastery of them, and brake all their bones in pieces, before they came to the bottom of the den. The chief priests and the whole council were looking for ways to falsely accuse Jesus, but were not successful. If you live a faithful life, people will not be able to find something credible by which to accuse you legally. In the three stories we have examined we see how the attitude of these men of God always reflected their faithfulness to God. There is a lot we can learn from these men! May the Lord help us to imitate their great example. In this brief lesson we have examined the topic, “The Christian’s Response to Slander.” We have learned about the reality of suffering and slandering. We can safely conclude that slander is part of the Christian’s suffering. Therefore, it is imperative that we prayerfully consider how we can response to this type of persecution from our adversaries. If you have not experienced false accusations, sooner or later you will. When the time comes, let me encourage you to carefully practice the wise principles we have examined in this lesson. May we never allow those who slander us to discourage us from living the kind of life God would have us to live. Remember that if we remain faithful unto death, a beautiful crown of life awaits us (Revelation 2:10; James 1:12; 2 Timothy 4:7-8). May the Lord give us the wisdom and encouragement to continue serving Him faithfully! With his mouth the godless man destroyeth his neighbor; But through knowledge shall the righteous be delivered (Proverbs 11:9). He that hideth hatred is of lying lips; And he that uttereth a slander is a fool (Proverbs 10:18). And I say unto you, that every idle word that men shall speak, they shall give account thereof in the day of judgment. 37For by thy words thou shalt be justified, and by thy words thou shalt be condemned (Matthew 12:36-37). Speak not one against another, brethren. He that speaketh against a brother, or judgeth his brother, speaketh against the law, and judgeth the law: but if thou judgest the law, thou art not a doer of the law, but a judge (James 4:11). Whoso privily slandereth his neighbor, him will I destroy: Him that hath a high look and a proud heart will I not suffer (Psalm 101:5). American Standard Version. Oak Harbor, WA: Logos Research Systems, Inc. 1995. Louw, Johannes P.; Nida, Eugene A. Greek-English Lexicon of the New Testament Based on Semantic Domains. 1996. Strong, J. Enhanced Strong’s Lexicon. Bellingham, WA: Logos Bible Software. 2001. Thayer, Joseph Henry. Greek-English Lexicon of the New Testament. Peabody, MA: Hendrickson, 2007. The Holy Bible: King James Version: 2009 (Electronic Edition of the 1900 Authorized Version). Bellingham, WA: Logos Research Systems, Inc.
 American Standard Version. 1995 (1 Pe 3:16). Oak Harbor, WA: Logos Research Systems, Inc.
 Wuest, K. S. (1997). Wuest’s word studies from the Greek New Testament: For the English reader (1 Pe 3:16). Grand Rapids: Eerdmans. The Holy Bible: King James Version. 2009 (Electronic Edition of the 1900 Authorized Version). Bellingham, WA: Logos Research Systems, Inc.
 American Standard Version. 1995 (Ge 39:1–23). Oak Harbor, WA: Logos Research Systems, Inc.
 American Standard Version. 1995 (Da 6:5–28). Oak Harbor, WA: Logos Research Systems, Inc.
 American Standard Version. 1995 (Mk 14:53–65). Oak Harbor, WA: Logos Research Systems, Inc. Thank God for Jesus Christ, His beloved Son! Thanks to Christ we now enjoy the hope of eternal life, that is, those who have obeyed the gospel. Some say there are approximately 170 references to the death of Christ in the NT. 3 Points to our lesson: 1. The nature of Christ’s death, 2. The purpose of His death, and 3. What our attitude should be in view of His death. Let us be doers of God’s Word as we study together (James 1:22; Luke 11:28). THE NATURE OF CHRIST’S DEATH. It was a very painful death (humiliated, Mtt. 27:28; they spat on His face, Mtt. 26:67; Beat and struck Him, Mtt. 26:67; 27:30; crucified Him (Mtt. 27:31). It was a death according to the determined counsel and foreknowledge of God (Acts 2:22-23; 1 Pet 1:18-20). THE PURPOSE OF CHRIST’S DEATH. To fulfill OT prophecies (Gen 3:15; Psalm 22; Isaiah 53). To save men from their sins (Matt 20:28; John 1:29; 1 John 2:2; Eph. 1:7). To show God’s love to the world (John 3:16; Romans 5:8). To reconcile men back to God (Ephesians 2:13-16). To provide an example of the kind of love we should have towards one another (1 John 3:16). To provide men the opportunity to enjoy eternal life with God in heaven (John 11:25-26; 1 John 5:11; John 14:6). OUR ATTITUDE TOWARDS CHRIST’S SACRIFICE ON THE CROSS. His death should motivate us to love God more (Mark 12:30). His death should encourage us to work fervently in His kingdom (Phil 1:21). His death should encourage us to live a holy life in Christ (1 Peter 1:13-16). His death should encourage us to share the great news of salvation (Mark 16:15-16; Matthew 28:18-20). Eternal life is in Jesus Christ (1 John 5:11). To be in Christ, men should obey the Gospel of Christ, be baptized into Christ (Gal 3:27; Romans 6:3-4). Plan of salvation according to the New Testament. A few years ago I attended a lectureship nearby. One of the speakers said something that really made me think. Notice what he said, “One of the reasons why many churches of Christ are drifting away from the truth is because they are not emphasizing anymore the fundamental truths of the Bible, such as: the inspiration of the Bible, the Deity of Christ, the existence of God, and the one true church of the Bible.” Friends, this preacher was so right! The church of our Lord Jesus Christ needs to go back to the Bible and impress upon our minds the need to be well grounded in the truth, concerning these great fundamental subjects of the Bible. Our convictions upon God and His Word will grow stronger if we continue to study these great fundamental subjects. Let me ask you the following questions: how much Bible knowledge do we possess concerning the Deity of Christ? How much knowledge do we possess concerning the existence of God and the inspiration of the Bible? Are we truly convinced that there is only one true church? Are we putting into practice 1 Peter 3:15, which encourage us to always be ready to give an answer? If we had the opportunity to speak for forty five minutes concerning any of these subjects, could we show people what the Scriptures teach on these subjects? Friends, let me encourage each of us to be diligent students of the Word (2 Timothy 2:15; 2 Peter 3:18), since this knowledge will help us to stay faithful to God’s will. A strong conviction upon these fundamental subjects of the Bible will help our young people to never leave the old paths. There are so many young people who go to College and Universities without having a strong conviction upon what God teaches in His Word concerning these fundamental doctrines of the Bible. Brethren, this is alarming! Let me encourage us to do something about it. Let me encourage our Bible teachers to spend time discussing these subjects. Let me encourage parents to do the same. May God help us to never neglect the study of His Word, especially the fundamental doctrines of the Bible! ovah is with us? But, behold, the false pen of the scribes hath wrought falsely” (Jeremiah 8:8, ASV 1901). Notice the phrase, “the false pen of the scribes.” These words were written about 600 years before the coming of the Lord to this earth. About 2,600 years have transpired since the writing of these words, and nothing has changed. Today, as it was the case in the Old Testament, many “pens” or “keyboards” are being used to write things that go contrary to what the Word of the Lord teaches. We have many false teachers writing and teaching people that baptism is not essential to salvation; the Bible teaches that it is essential to salvation (Mark 16:16; 1 Peter 3:21); others are saying that one church is as good as another; God says that salvation is only found in the church of Jesus Christ (Acts 2:47; Ephesians 5:23). Others are saying that the church does not need elders, but God says she does (Acts 14:23; Titus 1:5; 1 Timothy 3:1-7). Others are saying that you may worship God any way you want to, but God says you must worship in spirit and in truth (John 4:23-24; Colossians 3:17). “As also in all his epistles, speaking in them of these things; wherein are some things hard to be understood, which the ignorant and unsteadfast wrest, as they do also the other scriptures, unto their own destruction. Ye therefore, beloved, knowing these things beforehand, beware lest, being carried away with the error of the wicked, ye fall from your own steadfastness” (2 Pete 3:16-17). We must be very careful of those things we read through articles, books, magazines, etc. We must “prove all things and hold fast only to that which is good” (1 Thessalonians 5:21; cf. 1 John 4:1). We must, as John the apostle instructed, “… believe not every spirit, but prove the spirits, whether they are of God; because many false prophets are gone out into the world” (1 John 4:1). The false pen of the false teachers is doing much harm to the cause of Christ. Let us not be guilty of this! All quotations will be from the New King James Version. It is indeed an honor to be part of this fine lectureship. I commend the elders and the congregation for allowing this lectureship to continue for so many years. I also thank Brother Gabriel Rodriguez for the hard work he puts into directing this great lectureship. It is my conviction that thousands of people have been edified through the years with the lessons that have been presented by faithful gospel preachers. It is my prayer that God may continue to bless these efforts so that thousands of people may continue to learn more about God’s Word. It is my prayer that the things that I will say today may be of great encouragement to all of us. To God be the glory! Great lessons have been presented, and will continue to be presented during this lectureship. I commend the elders and Brother Rodriguez for selecting a topic that is much needed today. Church conflict avails much today in many congregations of the Lord’s church. Lessons like these ones will help the brethren learn how to deal with these problems. It is my conviction that we, as members of the Lord’s body, must strive to avoid conflict at all cost. Let us remember that Satan is trying to destroy the church for which our Savior died. The Bible describes Satan as our enemy (Matt. 13:39), the wicked one (1 John 5:19), the roaring lion (1 Pet. 5:8). He will try his best to use even Christians to accomplish his goal. Therefore, we must remain awake and consider lectureships like this one, something the church needs today. A great and much needed topic has been assigned to me. Lord willing, we will discuss for a few minutes on the topic “An angry and wrathful man stirreth up strife”, from Proverbs 15:18 and 29:22. This topic is very important for the following reasons: 1) It is a Bible topic, and 2) it is a topic that we need so much today. The church for which Jesus died on the cross has suffered so much because of the attitude of so many Christians who are not paying attention to what the Bible teaches on this very important subject. Brethren, our attitude can either encourage, or it can destroy people’s lives. Therefore, let us pay close attention to what the will of the Lord is on this very important topic. Let me take a few moments to define certain terms related to our lesson. This will help us to have a pretty good idea of what we’re talking about. According to The American Heritage Dictionary, “anger” is defined as a feeling of extreme displeasure, hostility, indignation, or exasperation toward someone or something; rage. Some synonyms are anger, fury, rage, ire, wrath, resentment, indignation. According to Holman’s Bible Dictionary, anger is defined as a feeling of being very annoyed and wanting to fight back at a person or thing that hurts one or is against one; rage. As we can see, these attitudes can lead us to some serious problems that may generate church conflict. As far as “wrath” is concerned, The American Heritage Dictionary defines it as a violent, resentful anger; rage; fury. It is a manifestation of anger. These definitions help us to understand what we are dealing with. These attitudes, when not controlled by Christians, can bring serious conflict to the church of Jesus Christ. Therefore, let us consider some helpful points about this very important subject. And once again, it is my prayer that the things that I will say today, be of great encouragement to all of us. May we learn as much as we can! Yes, there is a positive side to anger. Anger is a natural feeling of human beings. God has created men with this kind of feeling. As we read the Scriptures, we realize that God commands us to be angry. For example, the apostle Paul, writing to the saints at Ephesus, wrote “Be angry, and do not sin: do not let the sun go down on your wrath” (Eph. 4:26, NKJV). If being angry at all was sinful, then we would not find Scriptures like this one. Of course, God has given us an explanation of how far we can go with anger—“do not let the sun go down on your wrath”. The feeling of being anger must be controlled by Christians at all times. Let me suggest a few examples of positive anger that may be felt by Christians today. We should be angry when we see how others (Christians and non- Christians) have no respect for Bible authority. We are commanded to have respect for Bible authority (Col. 3:17); nevertheless, it is sad to see how many Christians around this world have no respect for the authority of the Scriptures. Many today are introducing changes to the church that are not authorized by God. Many Christians do not get angry when their preacher teaches false doctrine about salvation, instrumental music in worship, and many other subjects which pervert the doctrine of Christ. We should have a feeling of indignation when things like these take place. Change agents are causing much grief in the church today. These are people who have no respect whatsoever for the authority of the Scriptures. When we observe this kind of attitude, we must have indignation. Sadly to say, many Christians today feel nothing when false teachers take over the church. Most Christians do not get angry when the authority of the Scripture is being ignored by so many. A positive feeling of anger can help us to deal with this kind of problems. Feeling anger when this takes place will lead us to do something about it. It will help us to deal with this kind of problems. The apostle Paul was extremely angry when false teachers spread their erroneous doctrines. This helped him to deal with this kind of people. But, his dealings with false teachers were done according to the will of God, and not according to his way of thinking. The apostle Paul never fought physically those false teachers who perverted the gospel of Jesus Christ. We must not allowed anger to take control of us to the point in which we violate the will of God. We should get angry when we see how Christians have no respect and reverence for God. God’s word commands us to love Him with all of our hearts, mind, soul and strength (Mk. 12:30); nevertheless, many Christians today have no love for God; much less reverence for Him. People love to attack God at all times. It seems like the whole world is trying to get rid of God, instead of coming to Him and accepting His will. We can see how people in the media attack God and His word. This is sad brethren, and ought not to be the case. It is sad to observe how so many Christians see these things happen, and feel nothing about it. Sometimes they act as if they agreed with them. We should get angry when we see how Christians are indifferent to the work of the Lord. God’s word commands us to work diligently in His kingdom (1 Cor. 15:58). God has done so much for us. It is a sinful action from our part not to be thankful with the Lord for all that He has done for us. We must get involve in the Lord’s work. Remember, He deserves the best from all of us. It is a matter of indignation to see how Christians are so indifferent to the work of the Lord. It is so sad how Christians do not get involved in the work of evangelism. This is a lack of love from their part towards the work of the Lord. We should be angry at sin (Psa. 97:10; 101:3; 119:128). The Bible commands us to hate sinful practices. Let us remember that our Savior died on the cross because of sin (Rom. 5:8). How can we continue to live in sin when we have died to sin? (Rom. 6:1-2). We must feel indignation towards sin and stay away as much as possible. Let us remember that without sanctification, no one will see God (Heb. 12:14; Matt. 5:8). A feeling of anger towards sin will help us to love holiness, and hate sinfulness. Sadly to say, many Christians enjoy sin, instead of hating it. Many today talk about sin like if there is nothing wrong with it. Many laugh at sin, when in reality; they should feel anger towards it. Some times I wonder if we have forgotten what God thinks about sin (Hab. 1:13; Psa. 5:5; 1 Pet. 1:15-16). As we can see, we as Christians have the right to get angry or feel indignation when such things take place in the church. Nevertheless, we should never let the sun go down upon our anger. When this happens, we let the wrong attitude enter our hearts, and this may, and will cause, harm to the cause of Christ. We should, and must have control over our anger. Not to do so will bring about conflict in the church. This will ultimately result in the church getting hurt. But, anger, when felt properly, can help us to solve problems in the church. Moses—this man of God gave in to anger when he struck the rock at Kadesh instead of speaking to the rock (Num. 20:1-13). Moses violated the command from God by allowing anger to take control of his life. This anger took him as far as ignoring the will of God. So, as we can see, anger can take us as far as practicing the sin of disobedience to the will of God. Cain—this man came as far as taking the life of his own brother. This took place because Cain allowed his anger to take control of his life (Gen. 4). Anger, if not managed, can take us as far as taking the life of someone. This can be done, either physically or spiritually. We may come to the point in which we may hate our brethren if we are not careful. Doing this may lead us to be guilty of spiritual murder (1 John 3:15). The apostle Peter—this man of God allowed anger to take him to the point of cutting Malchus’ right ear, when Jesus was being taken by the guards before His crucifixion (John 18:10). Many Christians who have not controlled anger have come to the point in which they use physical force to get revenged. Even though Peter had every reason in the world to protect Jesus; nevertheless, his action was not justified in the sight of God. We cannot get angry in this manner and call it a righteous anger. James and John—these disciples of Jesus allowed anger to take control of their lives to the point that when Jesus was rejected by the Samaritans, they ask Jesus weather they could pray to God so that fire may come down from heaven and kill the Samaritans (Lk. 9:51-56). Their anger was so terrible that they came to the point in which they were blinded, and all they could think of was to take people’s lives away from them. There are so many examples in the Bible of negative anger, which must be avoided by Christians today. May God give us the strength and the wisdom to be able to control anger when this attitude comes to our hearts in a negative way. Let us remember that anger becomes sin when this attitude brings us to violate God’s word. Anger, when not controlled by Christians, will bring about conflict in the church. Sadly to say, we have many Christians today who have allowed anger and wrath to take control of their lives to the point that they hurt one another. These attitudes, when not handled properly by Christians will cause the cause of Christ to be hurt. There are many examples of daily Christian living that we can make reference to, to see and understand how these attitudes bring about conflict in the church. For example, I am reminded of a Christian who always wanted things to go according to his will. Well, one time, the men of the congregation made a decision that he did not agreed with. After the decision was made, this Christian man got so angry that he started saying awful things to the rest of the men, and also came to the point in which he ask one of the man to step outside of the church building to fight. In another similar situation, one of the men from the congregation was teaching a Bible class. He made a comment that was not taken well by this other member. Well, the brother who was teaching the class was invited to go outside of the church building to fight. This brother had a real problem with anger. We become a bad example to others, especially visitors. Let us remember that we are to be the light of the world (Matt. 5:16). We cannot be the light of the world when we display an attitude that goes contrary to the will of God. A bad example from Christians who cannot control anger may cause a person to stumble. We may also cause a visitor to stop coming to church services and hear the word of God being proclaimed. No one wants to visit a congregation where the saints are always fighting and speaking evil one against the other. The growth of the church will be affected when these attitudes prevail in the church. I am reminded of a situation in which some members of a congregation were fighting in the midst of church services. They were exchanging words among each other. Later, I heard that some of the members had brought visitors that day to worship services. The members struggle to convince the visitors to come, and in the day they came, all of this took place. I was told that the visitors had said that they will not return to this congregation anymore. As you can see, this kind of behavior brought serious consequences to the congregation. These brethren became a bad example to the visitors of that occasion. This attitude has occurred in many congregations. May God help us to not be a stumbling block to others. We forget our responsibility to love one another. Jesus has commanded us to love one another (John 13:34-35; Rom. 12:9). We cannot love one another when we are challenging one another to fight. We cannot love one another when we allow anger to cause us to speak evil against our brother or our sister in Christ. I am reminded of an experience I had with another preacher who wanted to physically fight me because he did not want to accept his wrong doings. I spoke to him about his false teachings, but refuse to accept responsibility. The good thing about this is that it was over the phone; otherwise, I would have been hurt pretty bad! This was, and still is a preacher who teaches false doctrine, and likes to get his way all the time. As far as I know, he has challenged to fight many members of the congregation where he preaches. Brethren, this ought not to be the case! We need to remind ourselves of what God’s will is concerning brotherly love. It keeps us away from forgiving one another. There are many Christians who are harboring anger and wrath in their hearts, and this is keeping them from forgiving those who sin against them. There are many members of the church who will not speak to one another in church services because they are angry to one another. It is amazing to see how many Christians have allowed anger to penetrate their hearts to the point that they will not forgive. Jesus teaches us that we must forgive one another (Mk. 11:25-26; Col. 3:13; Eph. 4:32). Not to do so will make us guilty of not obeying the will of God. Anger hurts our lives physically and spiritually. Nothing good can come out when we let anger take control of our lives. The sorrows that come when anger controls us are far too dangerous. We cannot live at peace with each other and with ourselves. One Chinese proverb said: “If you are patient in one moment of anger, you will escape a hundred days of sorrow.” Alfred Montapert said: “Every time you get angry, you poison your own system.” Ralph Waldo Emerson said: “For every minute you remain angry, you give up sixty seconds of peace of mind.” Each of these quotes teaches us a great lesson about anger. Some have suggested that when you get angry, the following happens: Your adrenaline surges, your heart beats faster, your palms sweat, your face flushes, your stomach pumps great gushes of ACID, you have trouble sleeping, you get depressed, moody, and introverted. All of these things affect your physical body. Let us remember that we must take care of our bodies (1 Cor. 6:19-20). Also, one experienced counselor stated that 50% of the people who came in for counseling had problems with dealing with their anger. Anger can shatter communication and tear apart relationships and ruins both the joy and health of many. It is imperative that we acknowledge that this kind of attitude hurts the church for which Jesus gave His life (Acts 20:28; Matt. 20:28). This kind of attitude keeps the church from growing spiritually the way God would have it to growth. We need to remind ourselves that our responsibility consists in striving to keep the unity of the Spirit in the bond of peace (Eph. 4:3). We must “pursue the things which make for peace and the things by which one may edify another” (Rom. 14:19). This is something we need to remember all the time. Tell people off! Bang the wall! Go into the closet; close the door, scream to the top of your lungs! As we can see, this is not what God would have us to do. Therefore, may I encourage you to reject what the world says you must do about how to deal with anger. Now, let us consider what you and I can do to overcome anger. We must be gentle, longsuffering, and loving towards one another (4:1-2). We must endeavor to keep the unity of the Spirit in the bond of peace (4:3). We must put away sin from our lives (4:17-19). We must imitate Jesus Christ (4:20-21). We must put away the old man, and put on the new man (4:22-24; 2 Cor. 5:17). We must put away lying from our lives (4:25). We must not let the devil in when we get angry (4:26-27). We must not let corrupt speech come out of our mouths (4:29; Prov. 15:1). We must put away every negative attitude from our lives (4:31). We must be kind to one another and forgiving each other (4:32). These are some of the things that we may consider to overcome anger and wrath. Let me suggest a few more that we may consider. We need to be obedient to what God says about anger (James 1:20-21; Eph. 4:26; Col. 3:8). We need to acknowledge that these kinds of attitudes hurt the church for which Jesus died (Prov. 14:17; James 1:19-20). We need to remember the kind of attitude that God wants us to have (Matt. 5:16; Col. 3:13; Eph. 4:32; John 13:34-35; Heb. 12:14). We must remember that anger and wrath, when not control, can lead us to eternal punishment (Gal. 5:20). We must acknowledge that anger and wrath will hinder our prayers (1 Tim. 2:8; Mk. 11:25-26). We must remember that only a wise man turns away anger and wrath (Prov. 29:8). We must remember that we must pursue peace with all men (Heb. 12:14). We must think, before we act. We must realize that when we are slow to anger, this will appease strife (Prov. 15:1, 18). Let us pray to God continually that God may help us! It is my prayer that this lesson was helpful to each of us. I realize that we cannot do justice to this topic in the time we had; nevertheless, may we consider the information that was presented in this lesson. Let us pray to our heavenly Father that He may give us the wisdom and the understanding to do His will on this subject of anger and wrath. Let us strive to the best of our ability to do as much as we can to let peace prevail in the church. May negative attitudes be rejected by the children of God who have a deep desire to be in heaven some day. Christian or Campbellite? Oh, what a question this is! Brethren and friends, any honest and diligent student of the Word would never answer “Campbellite” to this question. Why? The answer is simple: The Bible nowhere authorizes this title to be used in reference to those who follow Jesus Christ. “And whatever you do in word or deed, do all in the name of the Lord Jesus, giving thanks to God the Father through Him” (Colossians 3:17, NKJV). If we want to be true to the authority of the Scriptures, we must continue to reject any artificial titles which give men the glory and not our Lord Jesus Christ. The title “Campbellite” denotes a follower of Thomas or Alexander Campbell, men who during the late 1800s called people back to the pure Christianity of the Bible. These men had great intentions and wanted to help people live a life free of man-made religions. Their plea was to call people back to the Bible. However, just because they did this, does not mean that we are their disciples, and be called “Campbellites”. Sadly to say, many today are calling members of the church of Christ “Campbellites”. Notice the following statements from people who have no respect whatsoever for the authority of the Scriptures. These people whom Mr. Elam represents, with himself, make great claims to being the church Christ established, whereas the facts are that as a church they are some eighteen hundred years too young to be that church. Mr. Alexander Campbell is the ecclesiastical father of the church of which they are members, and it still has on its swaddling clothes. They have as their slogan the words of a Mr. Thomas Campbell, the father of their religious sect (Nichol, 768-769). In his 101 questions for Campbellites, pastor A.A. Davis of the First Baptist Church of Nowata, OK., asked the question: What are Campbellites? His answer was: These are known as “The Church of Christ,” or “The Disciples of Christ,” which believe that Water Baptism is essential to salvation in Jesus Christ. A Baptist publication called Calvary Contender (June 15, 1999) chastised the magazine Christianity Today for accepting an ad from Harding University of Searcy, AR. They argued that Harding is a “Campbellite” church of Christ school. They went on to say that the church of Christ is considered a cult in some regards because it allegedly teaches a “works salvation”. Campbellite refers to any of the religious groups historically descended from the Restoration Movement, a religious reform movement in the early 19th century in the United States. The major groups are: The churches of Christ, the Christian church (Disciples of Christ), the Independent Christian churches/churches of Christ, the churches of Christ non-institutional. Not many years ago, students from the Brown Trail School of Preaching, were involved in a door- knocking campaign. As they were visiting the community where they were evangelizing, someone came to the door and accused them of being Campbellites. Also, a graduate from the Brown Trail School of Preaching had a discussion with a preacher about the title “Campbellite”. This preacher argued that we need to be called “Campbellites” due to the fact that Alexander Campbell had so much influence upon the churches of Christ and was the one who started the church. Brethren, this is the kind of mentality that prevails in the minds of many people, even preachers of today. We need to go back to the Bible and call things by Bible names. We need to go back to the Bible and get our facts straight. The list continues on and on about how some people believe that we, members of the body of Christ, are called “Campbellites” and not Christians only. One thing that I would like to make clear is the fact that just because some publication, magazine, encyclopedia or man says that we are “Campbellites” does not make it so. Just because I say that a cow has five legs does not make it so. Anyone who accuses members of the body of Christ of being “Campbellites” need to go back to the Bible and learn what God calls those who follow Christ. WHY DO PEOPLE REFER TO US AS “CAMPBELLITES”? They have no respect for the authority of the Scriptures (Colossians 3:17; 2 Timothy 1:13; 1 Peter 4:11). They have decided to accept what others say about this matter and not what the Bible teaches (Jeremiah 6:16). Some of our members are quoting more what Alexander Campbell said than what the Bible teaches (1 Peter 4:11; Titus 2:1). Some people just cannot accept that we are Christians only. They refuse to accept the evidence that is before them. Some people just want to ridicule members of the body of Christ (Acts 2:13). Others simply do not have knowledge of what the Scriptures teach about who a Christian is. I am sure we can list more reasons why some people call us “Campbellites”; nevertheless, I believe these reflect what people have in their minds. It is my prayer that they will consider the evidence that is found within the pages of the New Testament. In the rest of this lesson I would like to offer several reasons why we are not “Campbellites” but Christians only. I hope that this information would clarify any doubts that people may have in their minds. One thing I can tell you for sure is that if a person is honest to the evidence, such person will accept it; but, if they are not, then, they will refuse to reason correctly about the evidence under consideration. It is my prayer that all of those who will read this information will accept it with an open heart. I trust that you will have an honest attitude concerning the evidence that is about to be presented. I ask that you please consider this information with an open Bible. Yes friends, we are followers of Jesus Christ and not Alexander or Thomas Campbell. The name “Christian” comes from the Greek word CRISTIANOS. This word denotes one who follows Christ, not Alexander or Thomas Campbell. Just because Alexander or Thomas Campbell taught some things that we believe are right does not mean that we are their disciples. Everything we believe and teach, we do, not because Alexander Campbell taught it, but because God said it in His Word. Everything that Alexander Campbell taught from the Bible was there even before he was born. Every faithful Christian will follow the doctrine of Christ and the apostles, and not the doctrines of men, which are condemned in the Scriptures (Matthew 15:7-9; 2 John 9-11). Every faithful member of the body of Christ will follow His teaching and not the human creeds which abound in our days. We follow Jesus Christ and not Alexander Campbell because He is the only way to salvation (Acts 4:12; John 10:9; 14:6). The apostle Peter made it very clear that we are to follow Christ because He is the only one that can save us. Neither Alexander Campbell nor other man can give us the salvation that we need. As we can see, the Bible uses the name Christian to describe the followers of Christ. The Bible nowhere uses the names Baptist, Campbellites, Luterans or any other man-made names that we hear today. We are called Christians because this is what God says in His Word. It is our desire indeed to always follow what the Bible teaches, and not what men, in their false doctrines, teach. We are members of the church of Christ, that is, the body of Christ because Jesus Christ established the one true church about 2,000 years ago (Matthew 16:18). This divine institution was not established by Alexander or Thomas Campbell but Christ. Just because someone says that Alexander Campbell established the church of Christ does not make it right. These men were not in existence when the one true church was established on Pentecost day (Acts 2). Therefore, how can we be “Campbellites” if we are members of the body of Christ of which we read in the pages of the New Testament? It simply cannot be the case that we are “Campbellites”. If they were the founders of the one true church, then we would have the right to be called “Campbellites” and not Christians. But, since this is not the case, then we are forced to come to the conclusion that we are Christians, followers and disciples of Jesus Christ. In the first chapter of first Corinthians we read about the division that was prevailing in the church of Corinth. These Christians were saying that they were followers of Cephas, Paul, and Apollos. The apostle Paul clarifies to them the following points: 1. Christ was not divided, 2. Paul was not crucified for them, 3. they were not baptized into the name of Paul. Notice the last point. These Christians were not baptized into the name of Paul, but of Christ. The Bible teaches that when you obey the gospel, you are added or baptized into the body of Christ (Acts 2:47; Galatians 3:27; I Corinthians 12:13). The Bible nowhere teaches that those who obey the gospel are added or baptized to a man, but to Christ’s body. The Bible nowhere speaks about Alexander or Thomas Campbell, but it does speak about Jesus Christ. Notice that Paul, Cephas, and Apollos were in existence when Paul wrote first Corinthians; however, the apostle Paul nowhere teaches that we are authorized to argue that we are added to their bodies, but the body of Christ. Therefore, we are Christians, not “Campbellites” because we have been added to the body of Christ through obedience to His gospel. Sadly to say, many religious people of our day have not understood what Paul taught in first Corinthians chapter one. They use names such as “Baptist”, “Lutherans”, and even “Campbellites”. These titles are not authorized in the pages of the New Testament, our pattern to follow. As members of the body of Christ, we must reject any man-made doctrines and titles that go contrary to what the Bible teaches. As I close this lesson, it is my prayer that you will consider this information with an honest heart. May we accept what the Bible teaches in all respects and not what man says. The Bible is clear about who we are. We are Christians only, members of the one true church we read about in the pages of the New Testament. May we never forget this great truth! As faithful gospel preachers, let us proclaim the Word of God without any addition or subtraction. To God be the glory! Did Alexander Campbell Establish the Church of Christ? via The Preceptor, Vol. 1, No. 8, June 1952. At one period in Campbell’s career he was affiliated with the Baptist denomination and even earlier he was a Presbyterian. After he and his father, Thomas Campbell, had both renounced the Presbyterian church, they began to study the question of baptism and were persuaded by their own investigations that immersion alone constituted Scriptural baptism. After they and several others had been immersed by Elder Luce of the Baptist Church (June 12, 1812), the Baptists of western Pennsylvania were jubilant at the “conversion” of these former Presbyterians and invited the Brush Run church, which the Campbells had organized, to join the Redstone Baptist Association. After lengthy discussions the Campbells affiliated with the Redstone Association but only with a written understanding that they would be allowed to teach whatever they “learned from the Holy Scriptures, regardless of any human creed.” Alexander Campbell remained a nominal Baptist for seventeen years (1813 – 1830), during which an ever increasing number of Baptists realized that he was “among them,” but not “of them.” Within three years following the admission of the Brush Run church to the Redstone Association, Campbell delivered an address before the annual meeting of that association, the famous “Sermon on the Law,” in which he expressed sentiments which were hardly compatible with orthodox Baptist theology. When he debated Maccalla in 1823, Campbell maintained that baptism was essential to salvation: and though Campbell was supposedly defending the Baptist cause, baptism for the remission of sins was unacceptable and heretical to Baptists as to Presbyterians. During Campbell’s seventeen years as a nominal Baptist his prestige and influence increased enormously in spite of his heterodox views. The process of separation was slow and often painful; but by 1830 the “Christians” or “Disciples” had been ousted from the Baptist denomination, and the Baptists counted their losses in the tens of thousands. Campbell was no longer a Baptist, even in name. The answer to this question is a most emphatic NO! Before one can be said to be the founder of any institution, it is essential that the institution in question never have existed prior to the period of its alleged founder. The church of Christ did exist long before the time of Alexander Campbell. Its establishment occurred in Jerusalem on that memorable Pentecost morning; its early history forms the theme of the Book of Acts; its needs for instruction were satisfied by the Epistles of the New Testament. Campbell’s enemies utilized every means at their command to criticize, ridicule, and undermine, his work. One of their favorite tactics was to accuse Campbell of being the founder of a new religious denomination; for they believed that if he could be branded a factionist, the founder of a new sect, his plea for religious unity would appear absurd to the religious community. Neither the facts of history nor the statement of Campbell himself give any support to the charge that he founded a new denomination. It follows, therefore, that when someone asks a Christian, “Didn’t Alexander Campbell found your denomination?” he reveals either an ignorance of the basic facts involved or a malicious design. If it be a case of insufficient information, he can be persuaded that the church of Christ is not a denomination and that Campbell was not its founder. If the question proceeds from malicious intent, the questioner illustrates again the power of religious prejudice! Did Alexander Campbell Restore the Original Church of Christ? It is implied that the church of Christ did not originate with Campbell or even during the period of his life; rather it originated and flourished before Alexander Campbell lived. Campbell believed in returning to the original standard, for this is the meaning of the term “restore.” When one restores something which has existed earlier, he does not create or originate; he attempts to reproduce an earlier work. “A restoration of the ancient order of things, it appears, is all that is contemplated by the wise disciples of the Lord; as it is agreed that this is all that is wanting to the perfection, happiness and glory of the Christian community … Now, in attempting to accomplish this, it must be observed, that it belongs to every individual and to every congregation of individuals to discard from their faith and their practice everything that is not found written in the New Testament of the Lord and Savior, and to believe and practice whatever is there enjoined. This done, and everything is done which ought to be done” (Christian Baptist, March 7, 1825). Is Alexander Campbell The Founder Of The Church of Christ? From time to time members of the church of Christ are inaccurately referred to as “Campbellites.” The implication is that the church of Christ was founded (started) by Alexander Campbell rather than being the Church of which we read of in the N. T. Most who use it today are only “parroting” what they have heard others say. Because of this misconception, I think it good to consider the question, “Did Alexander Campbell found the church of Christ?” It can be clearly & conclusively shown from history & from Scripture that Alexander Campbell was not the founder of the church of Christ. Secular history shows that efforts to restore undenominational Christianity had begun long before Alexander Campbell started his work. In the beginning of the 19th century there arose a group of men desiring to return to the apostolic order of things. These men saw what early ‘reformers’ (Martin Luther, John Calvin, etc.) did not see – the importance of ‘restoring’ things as they were in the first century rather than ‘reforming’ the apostate Catholic Church. These men expressed great dissatisfaction with protestant denominationalism with its various creeds, names, doctrines & practices. They held that man’s eternal salvation depended upon his full acceptance of things as they were in New Testament times rather than a choice between Catholicism & Protestantism. It is very important to realize that several of these men lived before Alexander Campbell by several years: For example: James O’Kelley (Methodist) who came to America 14 years before Alexander Campbell. In 1794 James O’Kelley & a group of his followers decided to lay aside all human creeds & return to the Bible (Alexander Campbell would have been 6 years old at that time, still living in Scotland). Barton W. Stone (Presbyterian) was in America long before the arrival of Campbell (Stone was preaching the restoration gospel 5 years before Alexander Campbell arrived in the states). Alexander’s own father, Thomas Campbell (Presbyterian), was in America two years before his son preaching many of the Restoration principles. These men (& others that could be mentioned) were in America working to restore primitive Christianity long before Mr. Campbell began his work. This was 78 years before Alexander Campbell was even born! But we can go back even further & find congregations of the Lord’s church in England in the 17th century. A Dr. Robinson (Overdale College, Birmingham, England) found an old record book dating 1669, containing the minutes of church business meetings for the Lord’s church meeting in the Furness Distict of Lancashire (North West England). From these minutes we learn that they called themselves church of Christ, practiced baptism by immersion, took the Lord’s Supper every Sunday, & had elders & deacons. At least 8 different congregations are mentioned in these minutes. So here we have a detailed record of the church of Christ existing over 100 years before the birth of Alexander Campbell. Very clearly, history does not substantiate the charge that Alexander Campbell started the church of Christ.